Buy a fully assembled Panzer, get 25% off a Splitframe Transporter FS 2 Fight Stick bag. We'll cover US shipping! It's with a heavy heart I post this, but RageousX has serious family matters to attend to. As such there may be some delays getting pre-order items shipped when they arrive and future FLORIDA WAREHOUSE items. Please keep he and his family in your thoughts. The ArcadeShock crew is headed to SoCal regionals 9/14-9/17. Please note, all shipping from the SoCal warehouse will be pending until 22 September. Sol Outpost, where the sunshines bright and it rains every single day for about 5 minutes, is up an running. Devon, aka RageousX, and Carm, aka R3versal, are taking on the day to day shipping for Arcade Panels, Fight Stick Panels, and other smaller items that I have offered in the shop over the past few years. They are huge assets to the shop and the FGC as a whole. I know they have provided me great advice and chats over the years about the community and thoughts in general. I warmly welcome them to the Jasen's Customs team and am glad they are enjoying the awesome weather out in my home state, Florida. NorCal Regionals: No shipping 15 March - 5 April due to preps, show attendance, and travel by the ArcadeShock.com crew. You may order items from the shop, however, please do not expect them to ship before April 5th. Thanks! The Panzer Fight Stick is back in stock and our partners at ArcadeShock are going to give you 25% off a Transporter FS Fight Stick bag with FREE shipping when you buy a fully assembled Panzer Fight Stick! These are limited right now, so act quick! It’s no secret that I am moving to Japan (or have moved to Japan). Shipping Panzer Fight Sticks and other awesome fight stick parts, arcade parts, etc. from Japan simply isn’t feasible; while possible, it would be difficult to meet the standard of quality, timelines, and reasonable shipping prices that you have come to expect from JasensCustoms.com since it’s inception in 2012. Fortunately, I have been able to forge a partnership with ArcadeShock.com over the years and their crew has stepped up to help maintain the JasensCustoms.com brand and the Panzer Fight Stick product line specifically while I am living abroad and serving our country in the U.S. Navy. UPDATE: We will be closed until the 24th. From Feb 7-21 the store will be closed for new orders while I conduct some much needed inventory assessments, conduct some travel, and shift warehouses to the ArcadeShock folks. Happy Thanksgiving - No SoCal shipping 21-30 November 2017 as I will be visiting family in Orlando, FL for the holidays. After a long deployment I need some time to relax and spend time with the wife away from the hustle and bustle of "work" in general. We are headed up to San Fransisco and Sonoma for a week to unwind and enjoy the sites California has to offer. I might even get a neat tour of Twitch's offices while I am there! Jasen's Customs is a proud sponsor of SoCal Regionals 2017. Be sure to tune in on Twitch to catch the great action and even better deals! Attending live? Enter the raffle and you could win this #PanzerFightStick a $500 value! Brook's PS4+ PCB - 2017 Update! 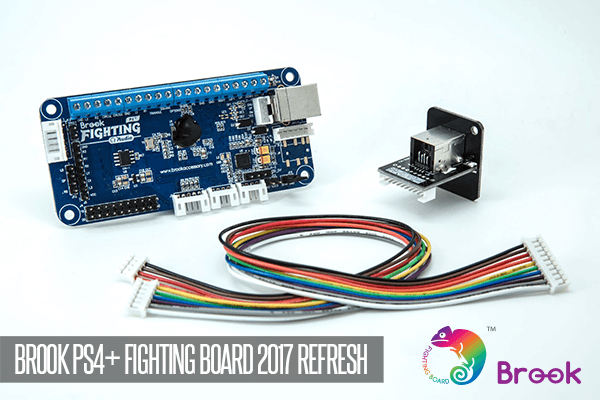 The Brook PS4+ PCB has been updated to be more compatible with more products available in the Fighting Game Community. Let's take a walk down memory lane and discuss how Jasen's Customs has helped shape this much needed revision and why you will be interested in the new version. Panzer Paparazzi Program Now Open! The Panzer Paparazzi Program is, by design, a way for Jasen’s Customs to give back to the loyal fans of the Panzer Fight Stick. By taking a couple of high quality, creative photos of your newly assembled Panzer Fight Stick 3 you can earn a cash back reward on your purchase. A brief overview of the Panzer Fight Stick 3 front panel connections. Today we cover the updated Terms of Service for Jasen's Customs - Refinements to the Refund, Return, and Cancellation policies. Why won't it let me check out with this item? Hey everyone! Just wanted to provide an update and reiterate everything about JasensCustoms.com going forward until this fall while I am deployed. Happy Holidays from the Jasen's Customs labs. Well, this year's deployment is done and not a day too soon. I was able to make it back home just in time for Thanksgiving and surprise Rhiannon at the same time. Much to my dismay the surprise resulted in a turkey-free Thanksgiving dinner but the company was the best I could have had. I sat back and relaxed for about 10 whole minutes before I started ripping open boxes and sorting hardware for Panzer Fight Stick 3 shipments. Rhiannon even joined in as we drank some wine, my first in 4 months, and watched Gilmore Girls on Netflix. Don't judge me.